Family photos mean the absolute world to me. And I'm sure that that is, in part, because I come from a bit of a camera mad family. We take a lot of photos, we have always taken a lot of photos. And I will forever be grateful that so many of my childhood memories are preserved because my mum and dad always thought to get the camera out. Just the other week we went out for the day and took 5 cameras with us, not including phone cameras. If that isn't a family commitment to capturing memories then I really don't know what is. Some of my favourite old photos are ones of the four of us together through the years... and I'm sure it's no coincidence that I've become obsessed with taking photos of my own little foursome, knowing how many lovely memories are held in photos of my original foursome; my original me and mine. This photo was taken on New Years Eve/Day of 2008/2009. We had gone away to Center Parcs to celebrate and we had such a fun time. 2008 was my last full year as a Bennett, before getting married in 2009, so I think it's really lovely that we thought to capture this photo of our little gang. I have no idea why my dad is wearing my mum's hat... I think we should probably blame the alcohol that had been consumed in the evening before we headed out to watch the fireworks on the beach at midnight. I have great memories of what a fun night it was. All us mad Bennetts dancing dancing on the sand, kissing my fiancé at midnight and screaming "We're getting married this year!!! 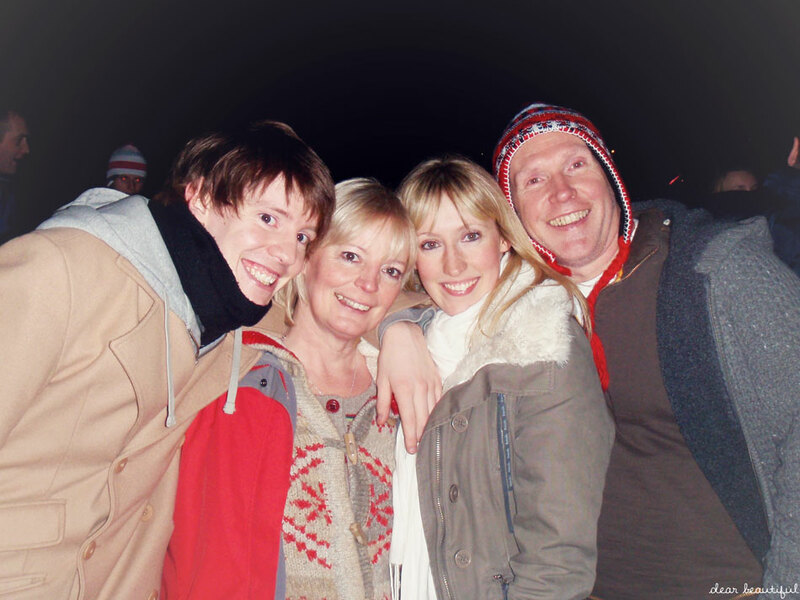 ", my brother Matt and I swigging champagne from the bottle and shouting "HAPPY NEW YEAR" with random American accents. If my kids have half the amazing memories captured through photos that I do, then I'll consider myself to have done a good job. Love, love, love this!!! My dad has the same camera obsession so we have hundreds of amazing captured moments too. Sounds like you guys had a very special New Years Eve back in 2008, truly a night to remember. Also, love that this is the 'original me and mine' - great shot, with happy memories. Oh Lucy this is so truly beautiful. The original me and mine indeed! What a lovely family you have and sounds like you had an amazing growing up experience. I know you are just as great a mother and your two will recall their childhood as as amazing if not more than yours. It says it all in their smiles in all their photos just as it does in this photo of you all. So happy so much love flowing between you all. I love that your dad is wearing your moms hat and probably being silly with it. I bet he was a fun dad. Great photo! Lovely post babes.